Towering above the city was the Acropolis – in the dark of night it is lite up in stunning golden tones against the deep dark sky above. The view from the rooftop terrace of my hostel in Athens is stunning to say the least. I wish I’d brought my camera up so I could show you how impressive it was, but no, for once I just enjoyed the view. To tie up my Greek adventure after some incredible Greek Island Hopping, I left my friends at Mykonos and decided to stay one night and day in Athens. I’d heard time and time again, that Athens wasn’t nice and all I needed there was a day. Well, maybe that was true if I wasn’t injured and walking at half the pace. To be honest I don’t think Athens was as bad as I’d been told and I probably could have easily filled another day and taken more time looking at the things I saw. Obviously the highlight of Athens is the Acropolis. It seems fitting to imagine it like the heaven above a city, given the amount of history and temples it holds. Like many places in Europe I’ve been, such as Pompeii and Rome in Italy, Athens provided the opportunity for a reality check. I had learnt about the Acropolis during ‘Classical Studies’ at high school and now here I was standing in it. The Parthenon demanding attention was in front of me, making me remember all the wars this site has been through. The Erechtheion, where Poseidon trident struck the earth, and Athena produced the olive tree – just meters away. Incredible. The Parthenon is huge and is utterly impressive that it is somewhat still standing here to see, yet I was more taken by the beauty of the Caryatids on the southern portico of the Erechtheion. The Caryatids are six maidens that act as columns supporting this area of the Erechtheion. The detail in them is amazing. How many people growing up in New Zealand actually get the opportunity to see these incredible places of history in their lifetime? Whatever the number, I wish it could be everyone. The Acropolis was massive to say the least. Pouring with tourists and heat beating down from the 30+ degrees, I’d opted to go in the morning to try and get through it alive. The detail still present was incredible. You can tell a lot of work has been done to maintain what was left and is still being done to try to rebuild it, it was still impressive. Following the Acropolis, I decided to venture inside the new Acropolis museum. I’d been humming and harring over this because all these places cost to enter and I was on a budget, but I’m so pleased I did. Firstly there was air-con. Secondly the vases, sculptures and reliefs were amazing. Again, these were items I’d learnt so much about when I was younger and I was so pleased to see them first hand, they had incredible detail in them. I couldn’t take photographs – but some aspects really looked in good condition considering their age and what they’d been through. Venturing onwards I saw the Olympic stadium, which was pretty massive. Sorry I can’t come up with a better explanation than that. The architecture didn’t have the wow factor that the London Olympic stadium had or the Acropolis that I’d just seen, but given the time that has passed and the issues Greece has been through, its understandable that it lays empty with plenty of hovering tourists. 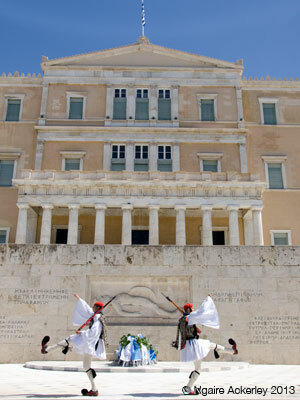 With many rest breaks in-between I made it to the parliament building of Athens and just my luck the changing of the guard was just beginning! These guards I’m sure were serious and meant business – but their outfit’s just look a tad silly. Braids and pompoms to say the least! I was pleased I had visited Athens and would recommend it to anyone else. It wasn’t as dirty and smelly and horrible that everyone had told me, so I’m learning not to listen to other people’s recommendations at times. If there is one thing travel has taught me is that everyone experiences a place and culture differently. Travelling solo allows you to have this unique experience without anyone else influencing it. Don’t be afraid to try places that people have or have not recommended, have your own opinion, your own experience. Accommodation: If you’re travelling solo like me, then AthenStyle is a good choice for a hostel that is central, easy to get to, with a great rooftop for views of the Acropolis. Must See: Obviously the Acropolis, but also check out the Acropolis museum not too far down the road to see many of the artefacts that they have kept. What’s up with the guards shoes!? PS. beautiful beautiful photos! (Sorry my comments aren’t very deep and meaningful today). So differently from the people that tried to scare you from Athens, I had a great experience there. Nice to hear you had a similar experience to me! Such an ancient city! I just want to mention, that the stadium above is not the Olympic Stadium of the Olympic Games 2004 (that’s OAKA) but Panathinaic Stadium (or Kallimarmaro), the stadium of the first modern Olimpic of 1896, built around 556 BC (so built in the ancient years) and today is the place, where the Athens Marathon run ends. Have fun now in South America and maybe our paths will cross again somewhere! Ahhh okay, thanks I must have been informed incorrectly! Happy New Year!